Hybridization between different species is common in nature but can be increased in frequency or even originated by human actions, such as species introduction or habitat modification. Three researchers from the department GENEV of the University of Geneva, Claudio Quilodran, Mathias Currat and Juan Montoya-Burgos developed a new theoretical model which allows investigating the demographic consequences of a specific type of hybridization, quite common among fishes and amphibians but poorly studied so far. They applied their model to the case of hybridization between salmons and trouts “which recently increases to very high proportion in some Norwegians rivers due to human translocation for fishing” says Dr Montoya-Burgos “and this process really needs to be studied more closely in order to establish management recommendations and eventually conservation strategies”. The three GENEV researchers published their results in the journal PLoSone in July. 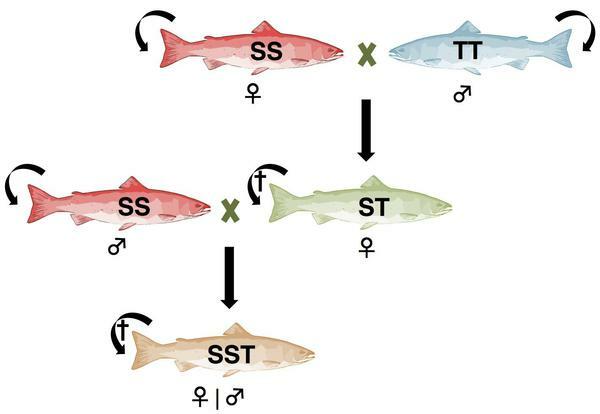 They show that hybridization alone is generally not a threat to salmon and trout populations but this can happen if this process is cumulated to other threats such as diseases that may affect one species more than the other. “This risk is even enhanced in small rivers and can eventually lead to the extinction of one parental population” adds Claudio Quilodran who is doing his PhD thesis on this subject. Dr Currat concludes that “this kind of modelling approach is extremely useful to better comprehend the evolution of hybrid systems and could be applied to many other real cases”.